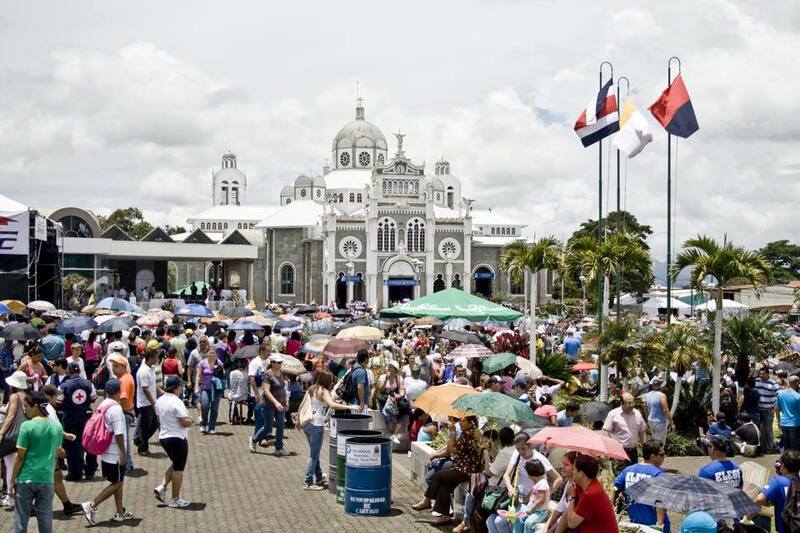 This devotion particularly took place in the village called “Puebla de Pardos”, situated at the outskirts of the capital Cartago, a village ethnically formed by descendants of blacks and indigenous people. The story of Our Lady of the Angels, dating back to the first half of the seventeenth century, in the year of 1635, when a native, indigenous and poor girl, who was called Juana Pereira, found the statue of Virgin Mary with Baby Jesus in her arms on a rock and brought her back to her home (Los Angeles , Cartago today). The next day the statue disappeared from her home and was found back on the same rock. The girl took it home again and the same events were repeated. Finally, the girl got fearful and she took the statue to the priest. The priest locked the statue and it went missing again. When discussed around it was known that a basilica was supposed to be built on the rock but its location was changed due to countless storms and earthquakes there. This incident was then taken as a sign that their patron wished the basilica to be built on the rock no matter what the dangers were. Her wish was granted and ever since the church has stood on the rock at Cartago. The people of the town named “ La Negrita”(Black Maddona) , the sculpture is black color and the Catholic Church decided to put the title of Our Lady of Los Angeles, because it was found on August 2nd , when the Franciscan Order venerates as its patron Saint Mary of the Angels. The sculpture high is 20 cm, it has mestizo features, round face, slanting eyes, small nose and mouth, and is made of different materials such as jade, volcanic rock and graphite. The church has since been restored and constitutes a unique mix of architectural styles from Byzantine to baroque, with a dash of Gothic. The interior is even more striking, with a colorful tile floor, intricately painted, faux-finish wood columns, and lots of stained glass. The current building dates back to 1939. At the basilica they wash themselves and drink the water from the rock on which the statue was found. Scientists have since found this water to be safe to drink even though no filtration or chemicals are used to purify the water. The basilica is open all day long and it is not uncommon to find several people stopping in for a prayer. In addition people will bring small silver medals shaped like body parts, where the shape represents the body part the pilgrim is concerned about. They leave them in front of “La Negrita” in hope that they will be cured. After a time, these medals are collected and stored. A selection of some of them can be seen in the Museum. 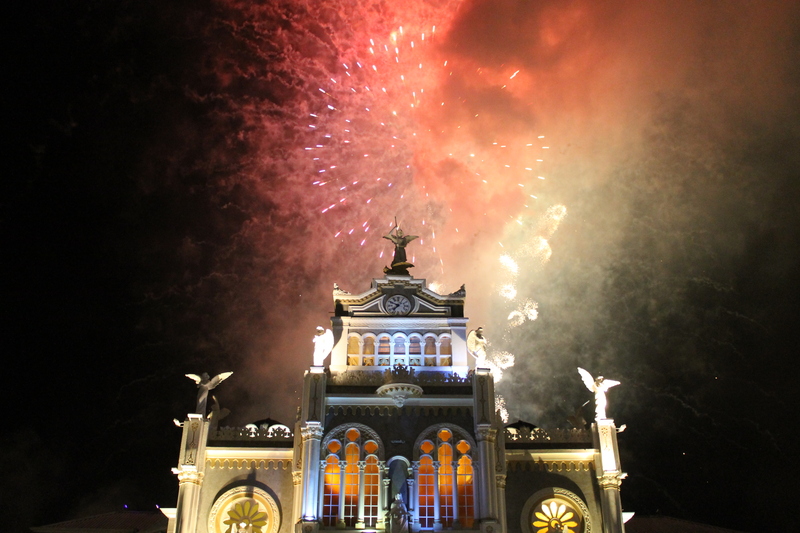 This holiday –August 2nd– it is the focus of an annual pilgrimage to celebrate the appearance of La Negrita, Costa Rica’s patron saint. To the left as you face the altar is a room decorated with amulets given in dedication to the virgin for her intercession in everything from triumphs over disease to triumphs on the soccer field. Trejos, Alonso (1991). Geografía Ilustrada Costa Rica (in Spanish). San José, Costa Rica: Trejos Editores. p. 128.